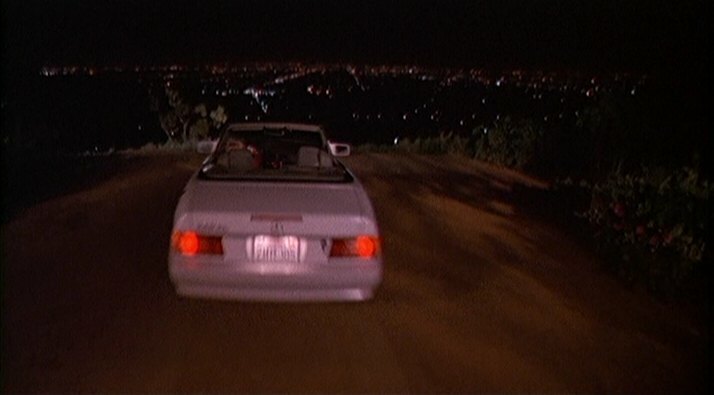 IMCDb.org: 1991 Mercedes-Benz 300 SL [R129] in "Death Becomes Her, 1992"
It would be 1990 model. 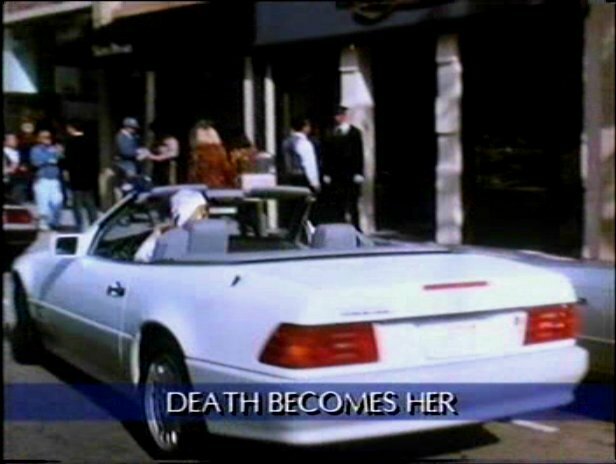 This '90-'93 white Mercedes 500 SL R129 was used in four-five scenes by Madeleine Ashton (Meryl Streep). In one of them was driven quite aggressively under the rain. Then in a dream of the other two main character was pushed down a cliff with the body of the woman in it and explodes (I don't know if real, I will study that scene). 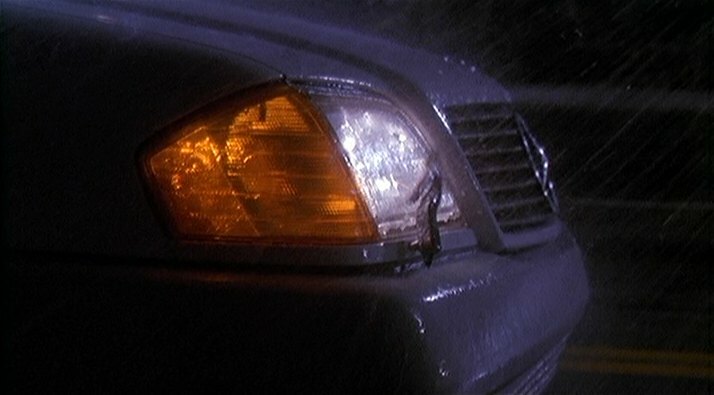 I love the earlier scene in the rain - close-up of the SL's headlight wiper. It is supposed to only operate when the windshield washer is activated, while the headlights are on. In this case, the wiper is running constantly without the washer. This is unusual operation, most-likely for effect purposes. Yes, I noticed that. Very good scene! Because of the steering wheel, this is either a 1990 or 1991 SL. I have the DVD and have paused the screen, though I couldn't get a perfectly still frame, to examine the badge on the trunk lid . . . and, from what I could tell, it's NOT a 500 SL V-8, it's a 300 SL I-6 base model. 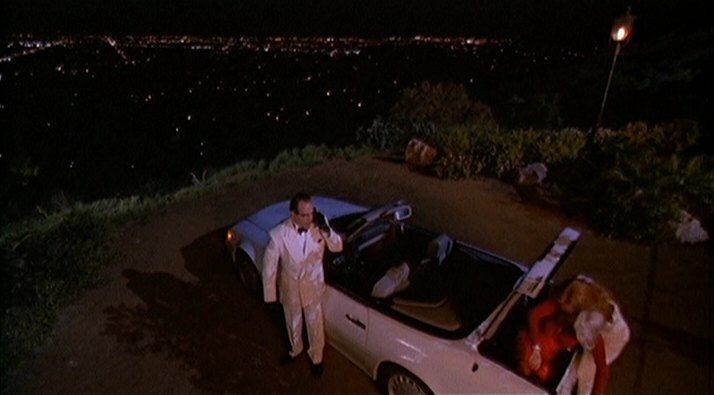 This was probably because of the budget on the movie; they didn't want to spent too much on a top model Mercedes-Benz (or more than one top model Mercedes-Benz) and total one in a scene, if the scene around Mulholland Drive was actually done. The interior isn't beige, it's grey. Well this car is a MUST HAVE thats for sure! And n the movie the interior is Grey! Mine is a 97 SL500 AMG and of course I bought a white one to match the one on Death Becomes Her! It was a really Bad A$$ movie! 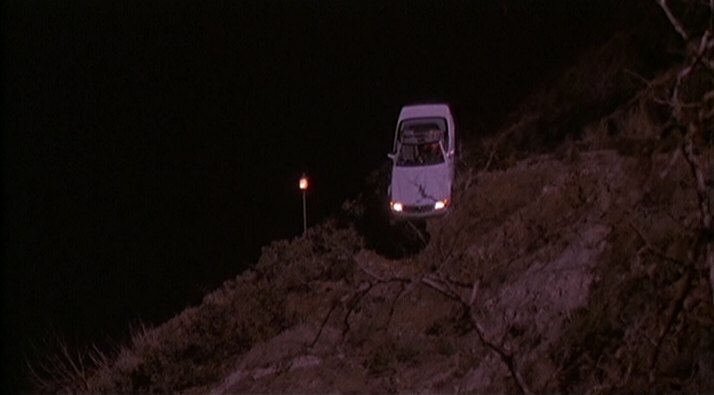 The scene with the Mercedes going off the cliff has been re-used in a few movies and TV series.